If moving out is something that is just a few steps away from you, then you should make a plan and start thinking about all of the things you need to do. One of your tasks will be to clean the rented property you will be leaving, as we all know that a lot of landlords require this procedure. You have three options here. The first is to take action in your own hands and do the cleaning on your own – if you know the secrets then you are good to go. The second choice is to try cleaning everything, but due to the lack of knowledge you can end up in waving goodbye to that refund of your deposit money. The most secure option, however, is to seek professional help. 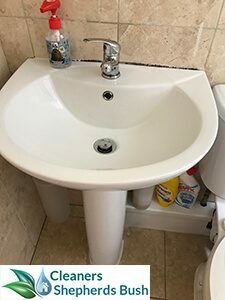 If you know how to clean, but don’t have the time, or you are simply not a cleaning person, you can rely on our top end of tenancy cleaning service in the whole area of Shepherds Bush. We are a professional cleaning agency that will gladly do the cleaning tasks instead of you and the end results will bring back that deposit money in your pocket! 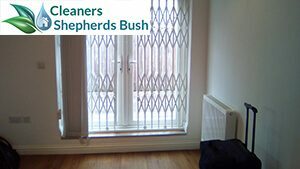 Cleaners Shepherds Bush has years of practice and thousands of hours in cleaning different properties in Shepherds Bush. We’ve mastered the cleaning techniques to perfection and our methods are absolutely harmless to the interior of any property! 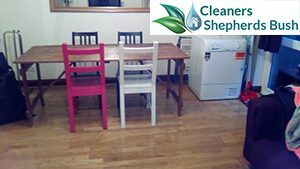 If you choose our end of tenancy cleaning in Shepherds Bush you will be able to book the service very easy and quickly. We are 24/7 available to answer your requests and book you an appointment for your soon-to-be-former residence! The prices of our services, including the end of tenancy cleaning, are all fixed and very competitive. We will not charge you any extra fees for the equipment we will use, or for the amount of accumulated dirt in the property! Time will also not have effect on the pricing! The only thing that matters for the price is how big the property is, how many rooms are there. One of the things that our customers love about us, is that we are available on weekends and national and bank holidays, too. This makes our working hours flexible and possible to fit in your schedule! The end of tenancy cleaning, that can help you, includes a thorough cleaning of every room – the surfaces, the furniture, ceilings, walls, everything from the bottom to the top! The procedures are done by professional technicians with years of experience in the cleaning field! They possess knowledge and know the tiniest secrets and tricks in cleaning any type of surface perfectly! The best weapons on the market nowadays are absolutely part of our battles against dirt, grime, dust, bacteria and germs. We have modern equipment and we use only chemicals-free environmentally-friendly cleaning products and solutions! After we thoroughly clean the property, you will not sense any unpleasant odors, because the place will be deodorized and ready to welcome its new tenants! We love to make our customers happy, so we have a 48-hours guarantee for the end of tenancy cleaning service! That means, if there is an inspection of the property and something is not quite right, we can – and will – come and clean it for a second time. This is not a frequent thing we do, because we clean perfectly with just one cleaning session! One of the best parts of our services is that we guarantee you a full refund of your deposit money! Our prices are relatively small compared to your deposit, so you can only win with the booking of our end of tenancy cleaning! 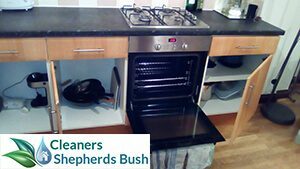 Wherever in Shepherds Bush you live, you can count on us to provide you with the most impressive end of tenancy cleaning and even exceed your expectations! A lot of our customers call us regularly and we are happy to have mutual relations with them, based on loyalty! Company Shepherds Bush will definitely take care of your rented property, as soon as you call us! Don’t hesitate, just dial the number and let us impress!